It is the month of September now, it means that the one-month-long Georgetown Festival 2014 came to an end now right together with national day of Malaysia. As I mentioned earlier, the only event that I participate in GTF 2014 is the "Binding & Weaving Pages of History", some kind of bookbinding workshop which was instructed by The Thistle Bindery. 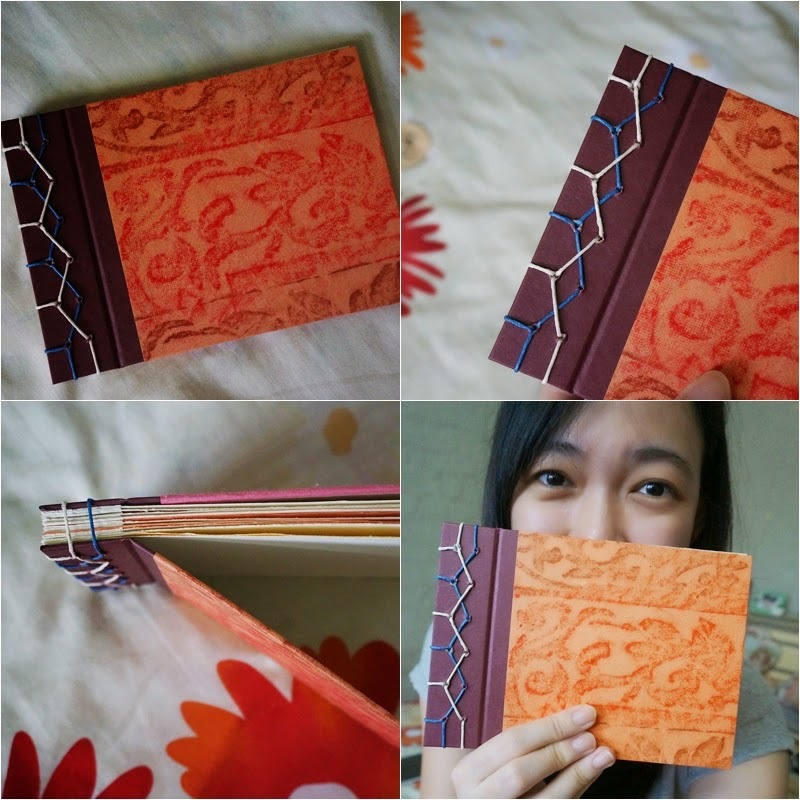 It was a 2 days bookbinding workshop and I registered for both days as I'm really quite into handmade kind of stuff. Our instructor, Ian Tan, who came from Singapore is a conservation architect and I have learnt a lot from him throughout the workshop; my enthusiasm towards craft/DIY is alive again, let's see how long can it stays in me. Even though I kind of stop the handmade moment of mine once I started to be really busy on my full time job, but the skills are yet rusted as they are born in me. Way the feather. I feel to post a little about the workshop to show you guys on how I spend my 2 days with Ian and with the books, papers. Only Ian has his apron with him when we started the glue-ing session to prevent the glue from dropping on his clothes, wish to get one for myself with my name on it. Talking about apron, I once asked the Starbucks barista whether I can get one of the Starbucks apron as well; of course I know the answer before I asked, but never try never know right? End up I didn't get that Starbucks apron. Love that wooden tool box that use to keep all the tools needed for bookbinding, now I just keep my handmade tools in a drawer, and here and there. Kind of messy, sometimes I can't even find the tools when I need it. Laugh. Different kind of bookbinding samples were displayed in the room but not for sale, they are masterpieces of Ian's for each workshop, that he also use them as his template during the workshop. You can see there are several type of stitching available here, but of course we can learn it all in 2 days, so we just learnt the basic, the rest I think we can find it online, in somewhere else. Since it was a 2 days workshop, I just roughly jot down what I have done and I think this would be a long post with plenty of photos. Enjoy! The workshop was held at Yeng Keng Hotel, 10am until 5pm as per stated in their schedule. Thinking that we only made books and nothing else? Nah, then you are wrong. The bookbinding session is actually started by 1pm onward, so we kind of visit the George Town area during morning session. Since we were going to make a photo journal kind of book, so we had visit some historical sites in George Town, took some nice photos and we can actually print them and paste it in the book that I were going to show later on. Ian work as a conservation architect, so he know well why and how the old people built the temples or houses with certain design, he shown and told us stories about the buildings; I'll never know this kind of things if it is not by him. We stopped at Yap temple, somewhere nearby Khoo Kongsi to make some stone rubbing with crayons that provided by Ian. Of course we did asked for permission before we really did the stone rubbing on their carving, some people might not allow and feel that it might spoil the carving. To prevent the crayons from contaminate the carving, we first put a tracing paper before we did stone rubbing on the recycle paper that we going to make it as our book cover. The grey shirt guy is Ian, who trying out the carving pattern on tracing paper before he rubbed on his book cover. I was first wanted to make the cover with pink base paper and blue crayons on top, later on I realized that it was quite 'dirty' to put on the cover, let's see what I have at the end. Random shot while waiting for others to complete their stone rubbing. Ian gave us full freedom after the stone rubbing, we separate into few teams to walk around the area before meet up at Yeng Keng Hotel at 1pm. Sharing is always the part where you let people know about you more and more, so we had some story sharing session before the bookbinding; the fun part started after that! I will not share any dimensional or the step-to-step bookbinding here, as I feel that we need to respect Ian for working so hard to conduct workshop here and there. You may sign up for Ian's workshop at Singapore which he will conduct from month to month, visit The Thistle Bindery facebook page for details. I'm sure if you are not in Singapore, you will still able to find some local instructor for bookbinding; or you can just date me out and I can teach you some basic bookbinding if you trust me lol. Here are all the tools needed for bookbinding, I'll not talk about some tools that you similar with. Awl and bone folder is needed the most for bookbinding; awl is the one where we used to make pinholes on papers and book cover so that we can stitch the book easily. Bone folder is use to fold paper and to remove the 'wrinkle' on the paper, it's a great invention as it really help a lot while we stick paper to paper using glue. Ian was selling awl and bone folder in the workshop, I got them with RM10 only which we couldn't get this price at the market. Bought it for 2 reasons: I want to make some books at home which need these and it's so cheap. Yeah, I always buy tools if they selling at low price even I know I might not using it or only once or twice in a year; sound rich lol. Glue and brushes. This ain't the normal white glue for handmade stuff that we can get at market place. I assume all of my readers know that starch can be made into glue after heat up with water, and it will be a perfect glue for crafting project. As per Ian, starch glue not easy to dry while white glue dried very fast, so he mixed both starch glue and white glue to make it perfect for bookbinding. I love this mixture of glue, very sticky towards your craft art but when come to your hand, it wouldn't hurt your hand even you touched it so long time. Ian even teach us, glue should apply on the surface with weaker absorption, for example paper vs cardboard, glue should apply on paper then stick on the cardboard but not another way round as the cardboard is with higher absorption level which will attract more glue on it and make the glue very hard to dry. I learnt a lot as I told you! Last but not least, the string. Before we really stitch our books, cut the string from arm to arm long, don't too long as it might trouble you while you stitch the book. Use bee wax to coat few layers on the string before you get the needle, this will prevent the string from becoming tangle while you start to stitch your book. Putting this size of string into a needle could be a problem too, your mouth play a very important role here where you need to bite it and make the string flat so that it can go through the needle hole. Don't worry with the bee wax, it's safe to eat. That's the photo journal book that made by myself, decided to put all photos into one if not this post going to load super slow and you might just leave this post before the photo finish loading. I like this cover page as it looks neat compare to the blue one I shown previously. Ian ended the workshop at 6.30pm as we accepted challenge and chose the more difficult stitching pattern, he did offered a simple one but this one looks nicer. Imaging that you need to get the string go through the pin hole on the cover/papers (poke with awl) 2-3 times, it's very hard to pull the needle as the space become tighter, I even broke a few needle. After I get the hang on it, it became so easy; I managed to stitch 2 books while others completed only 1. The tools that we used for day 2 were similar with the day 1, but we were no more using recycle paper as the cover page, we used dried lotus leave and challenge accepted again! The dried lotus leave itself is quite weak, it will just crack at somewhere else if you press it hard, so we apply a thin layer of coating (I forgot what it call, to make it looks shinny and strong) before we headed out to have historical walk again. We were not visiting any temples in day 2, but to go different markets and talk about spices this time. Ian wanted us to get some spices, and he explained the history of the spices, quite cool huh? So I got some mint leaves, cinnamon, black stone flower, peppers and etc., so each of us required to talk about how grandmother stories that why we pick that spices before the bookbinding session. The book binding is more or less the same as day 1, but this day we kind of make some collection book which consists of paper bags instead of paper, once done it will become something like files that you able to keep postcards, tickets or tiny things you found throughout your journey. I didn't write much about day 2 as all the things we used or did was the same, just we changed the inner papers to file kind of bag, I just straight away show my masterpiece. This is it! Cool right to have lotus leave as cover and we able to finished the class before 5pm, as most of us who attended the first day workshop know how to stitch by ourselves by looking at the pattern provided by Ian. This one is the easy one with long stitch at the spine of book, but I did not know Ian will going to make a tie at the middle part of the stitch (the blue color string), so I pulled the string (red one) as tight as possible, ended up the knot seems a bit weird at the middle. Ian said it's a good thing to have tight string along the pages, so that the inner papers wouldn't move around easily. Mission completed. 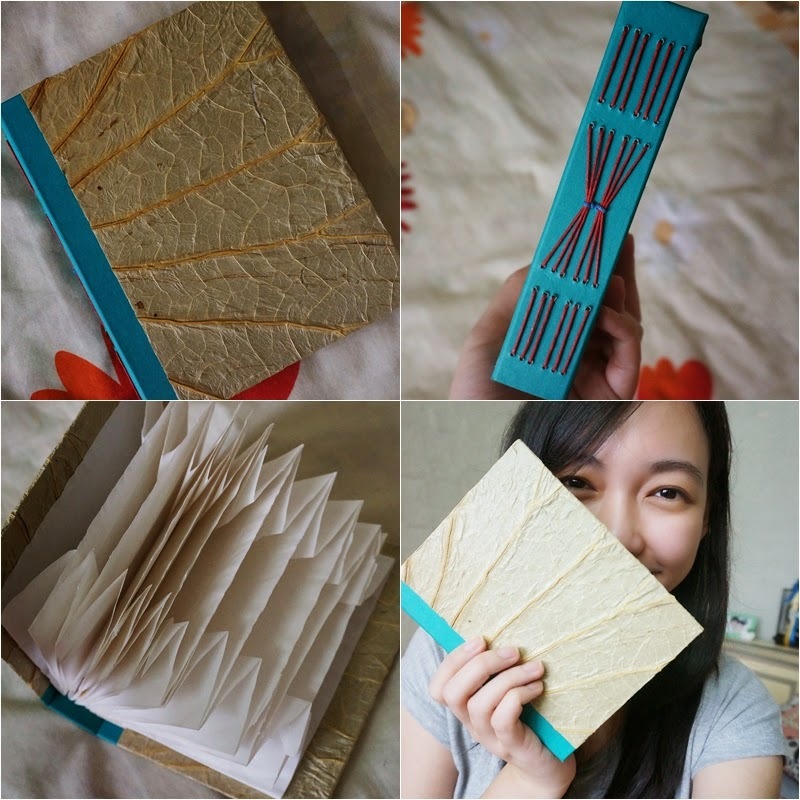 Here's the details for The Thistle Bindery, if you are interested on bookbinding, do contact them. I haven't watch [等一個人咖啡], but watched [The Hundred Foot Journey], quite nice!